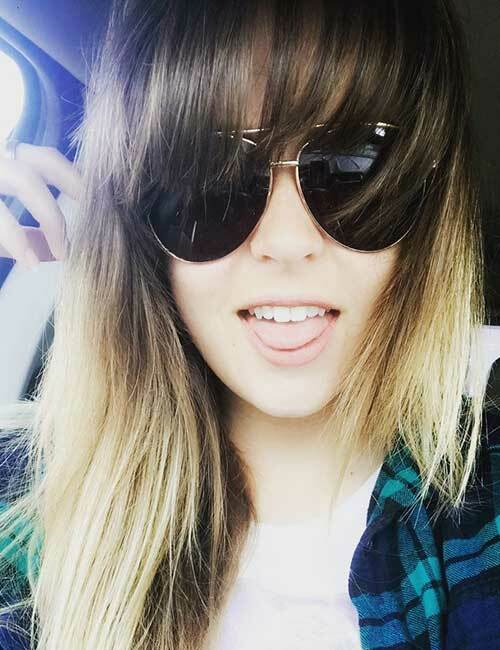 Bangs are back! 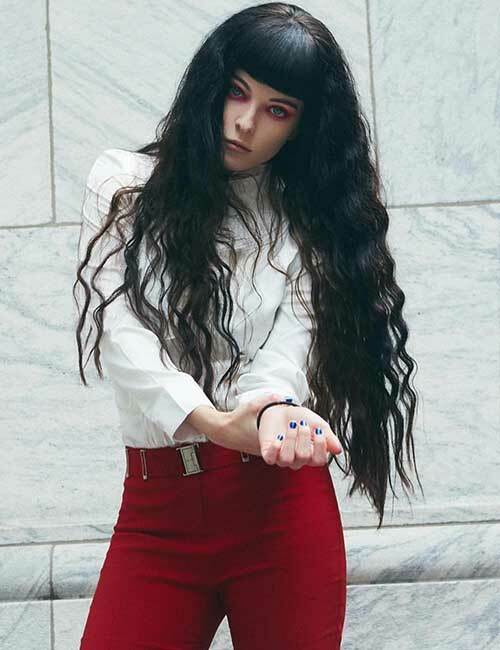 If you have long hair and are bored of your typical hairdos, try having long hair with bangs. They add a freshness to your look and provide volume to your hair. Here are 40 best long hair with bangs hairstyles that will take your breath away. But, before going onto all of that, let’s see what kind of bangs you should opt for. All kinds of bangs do not look good on all people. The way you should style your bangs depends on your face shape. But don’t worry, we’ve got your back. Let’s take a look at which one you should opt for. If you have a square face, then keep your bangs straight and just below the eyebrows. Straight bangs, feathered in the center, even out your face shape. If you have a round face, then an arching straight fringe that ends just below the eyebrows will add to the softness of your face. Deep side bangs also work. A perfect example of this is actress Jennifer Lawernce. She looks stunning in this hairdo! Arched side-swept bangs that become longer at the sides look amazing on heart-shaped faces. Beautiful Reese Witherspoon looks stunning in this layered side-swept bangs hairdo, and so can you! If you’ve noticed, Zoey Deschanel looks good with just about every fringe style. That’s cause she has an oval face. 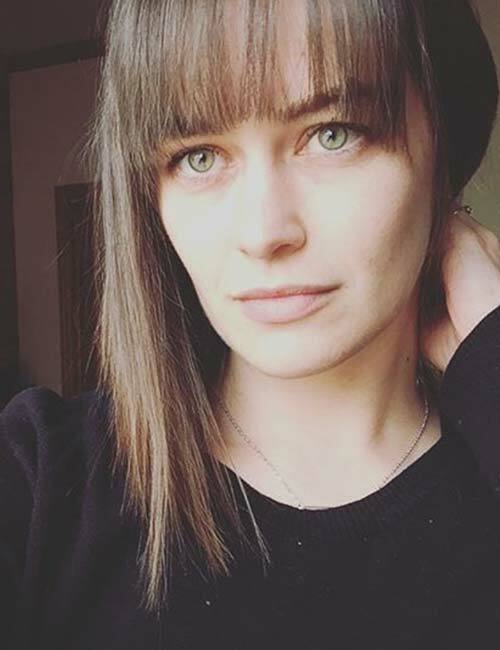 She is the face of bangs! It also depends on whether you have a high or short forehead. The way to check that is to see if your forehead is smaller or bigger than your nose. If your nose and forehead are proportional, then you can try out any of these styles and they’ll look great on you. If you have a long face like the gorgeous Nicole Kidman, then short bangs are a no-no as they will make your forehead look bigger. Try long bangs with either a full center or side swept bangs, and we promise it will look amazing. If you have a short forehead, then consider a sloped fringe that is longer on one side. It enhances your face structure, making it more prominent. 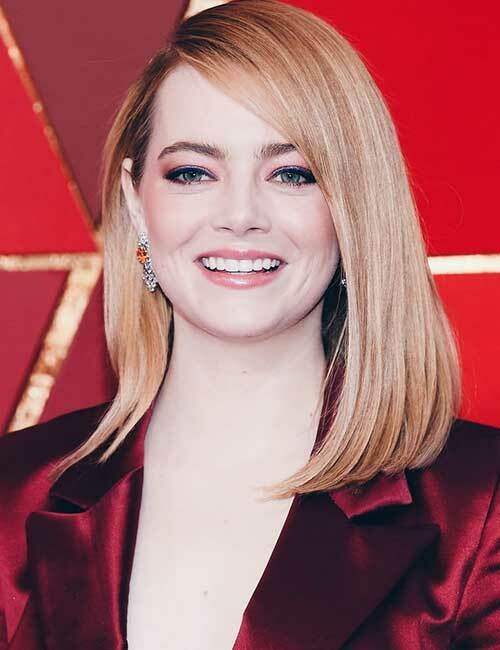 Check out Emma Stone rocking a deep swept bang. Epic indeed! If you have a high forehead, that’s one thing you have in common with Angelina Jolie. The full side swept bangs is the way to go. Let the bangs start at eyebrow level and taper as they reach the sides of your face. Now, let’s look at how we can cut our own bangs. However, it is always better to let a professional do it. 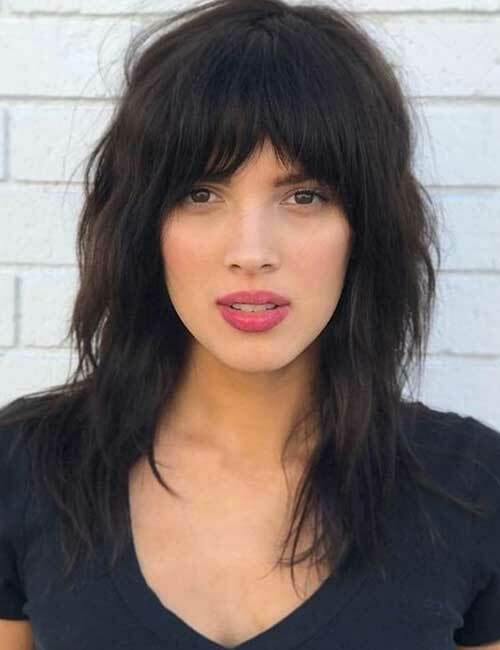 If you want a full center bang, take the front portion of your hair, and with the help of a rat tail comb, put it slightly in the shape of a triangle and cut it evenly. If you want it tapered, then cut it just below your eyebrows and keep making it long as it reaches your ears. The way to take the side parting right is to make sure it’s aligned with your eyebrows. That way when you cut your hair, it’s properly cut and not messy and all over the place. Once you are done with the first snip, begin cutting the rest of the fringes a little longer, therein giving it a tapered look. 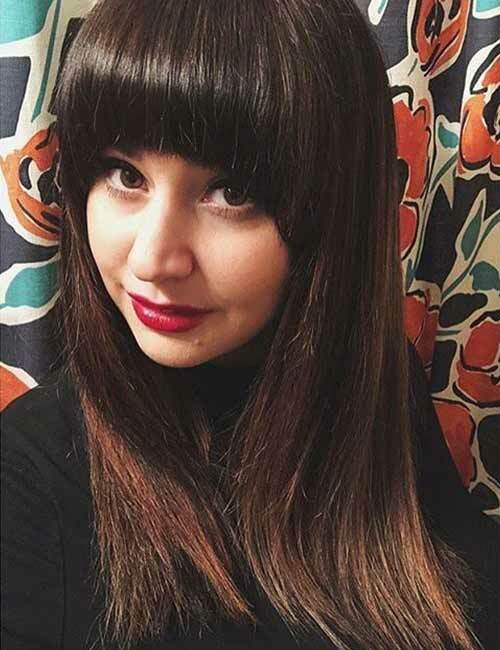 Don’t want to cut your hair but want bangs? We have got a solution for you! 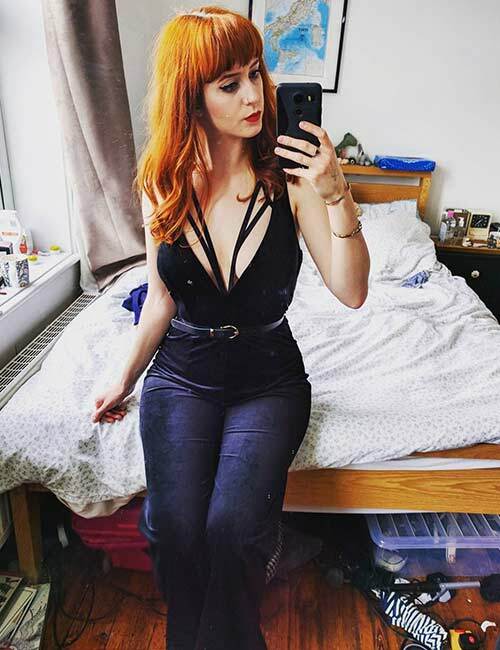 You can use extensions or simply try a faux bang. You’ll need elastic bands, pins or clips, and depending on how you want the bangs to look, you’ll need a curler. First, tie your hair in a high ponytail. Then, tie the remainder of the pony into a bun, messy or sleek. Leave the ends undone. Secure the bun. Then, take the ends, and using the pins, fix it at the front of your head. Curl them if you want. Wash it every alternate day with a shampoo that works well for your hair. Trim it every three weeks; fringe hair tends to grow more. Oil it for nourishment regularly. Oil your hair with warm oil and keep it on your hair for an hour before you wash it. Now, let’s get to it! Here are the 50 best long hairstyles with bangs for women. 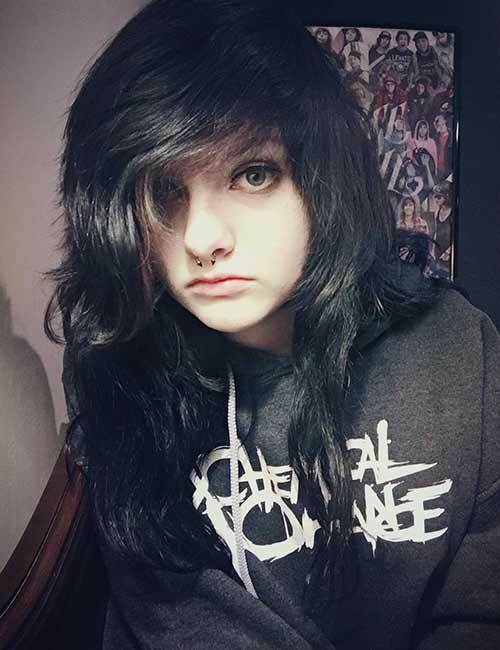 Rock messy hair with side bangs. This look is playful and adds definition to your face. 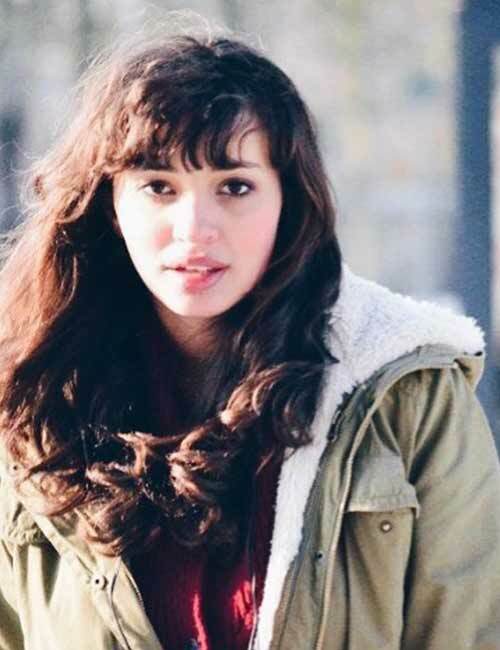 This is one of the best long haircuts with bangs. 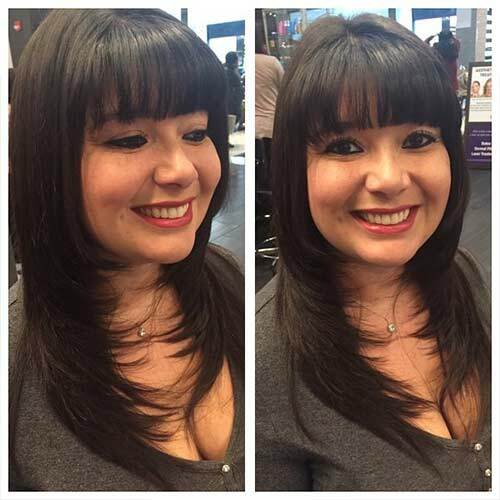 A layered cut with bangs gives the face a slightly longer look. 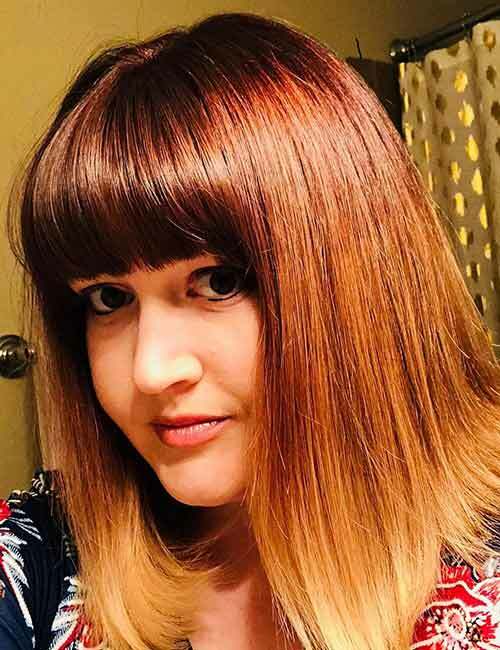 Perfect if you have a round face and still want straight bangs. Stun with this long layers and side swept bangs. The bangs will add a choppy edge look to the layers. At some point we all knew a person who had this haircut (or like me, I was this person). Choppy, uneven layered hair with deep side swept bangs paired with some black eyeliner is the quintessential punk rockstar look. 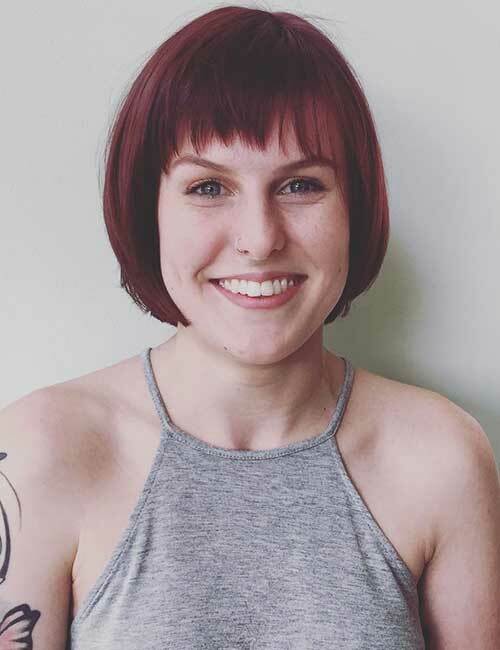 Short bangs are straight cut center bangs that reach mid-forehead. Short bangs, or baby bangs, bring more focus to the forehead and the shape of your face. Hence, not everyone can pull off this look. If you have a round or a heart-shaped face, it’s best to avoid this cut. People with oval faces can pull this look off best. If you’re looking to change up your look, try this look. 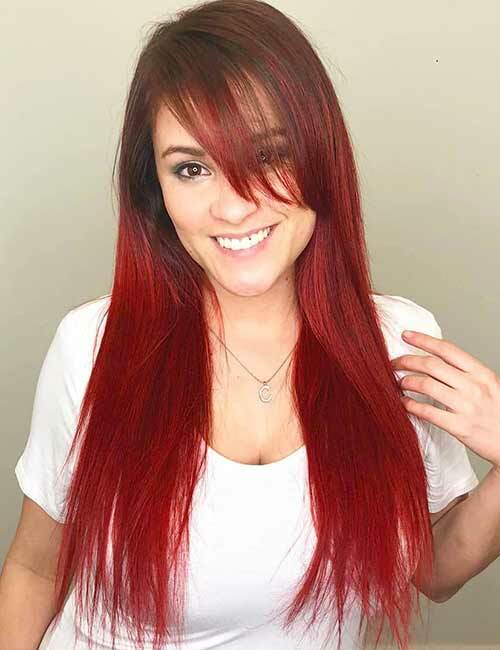 The red bangs accentuate your skin tone and eye color. 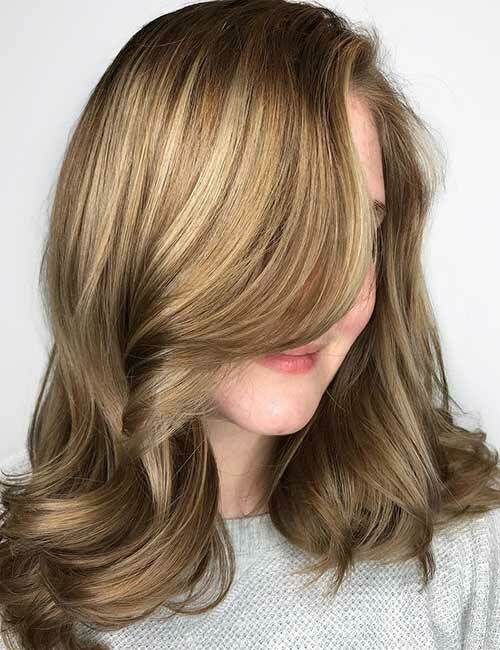 This is a fun way to experiment with your color and cut. Try thinning the edges as well to bring more definition to the hairdo. 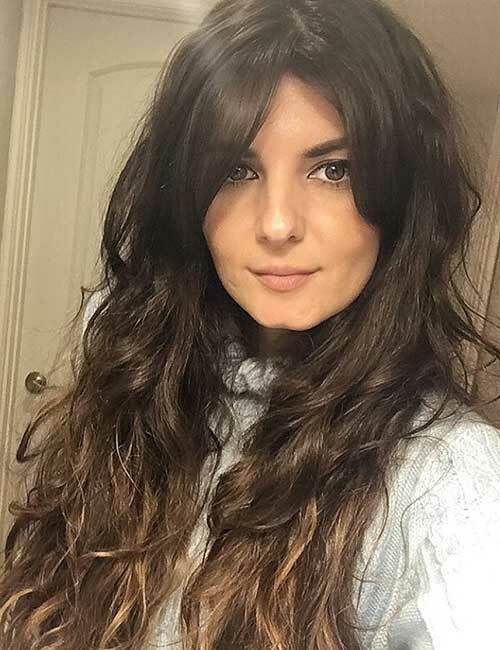 Long sea wave bangs that just blend in with your long wavy hair give off a slightly vintage and soft look. If you have a long face, you should try this. Messy, uneven bangs, feathered at the center, are perfect if you’re going for a carefree look. This is the ideal just-out-of-bed-and-going-to-rock it look. If your usual look is sporting side bangs and you have thick luscious hair, then try this look to add a bit more jazz to it. To get this look, take a triangularly shaped parting at the center, take the hair closest to the center point of the triangle, and cut it. This hairstyle looks best with heavy layers. If you have or love blond hair, then you should try this classic hairdo. 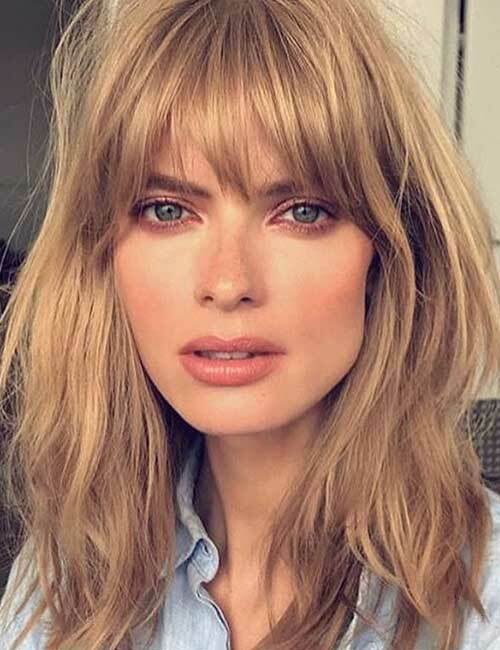 Long full bangs on flowy blonde hair look amazing whether it is to make a statement at the office or let loose at a party. Shoutout to all retro hairdo fans! This is a faux rockabilly bangs look. If you have long hair, it adds to the retro feel. Spritz water on your bangs, and put a bit of medium hold gel on it. Using a hair dryer and a comb, turn the edges of your bangs inside towards the forehead. If you’re looking for something uncomplicated and straightforward, this is it. This is the ready-for-anything hairdo, be it a business meeting, a photoshoot (like the stunning Behati Prinsloo) or a party. 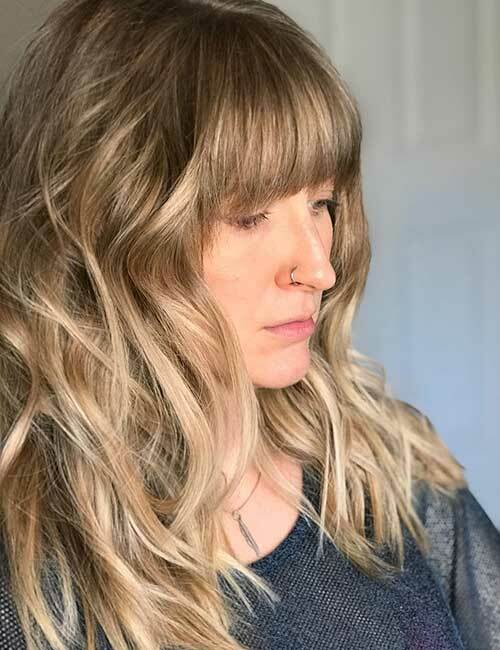 Slight wavy locks with front bangs that are thin at the center. Well hello, Bettie Page! Wavy sharp-edged bangs look terrific, especially if you have longish hair wavy hair. Choppy, uneven bangs are always in fashion. Pair it with straight hair that is tied in a loose ponytail. This look is fresh, simple, and ultra stylish. If you have thick, full hair, try tapered bangs. Don’t thin out your hair, flaunt thick bangs. 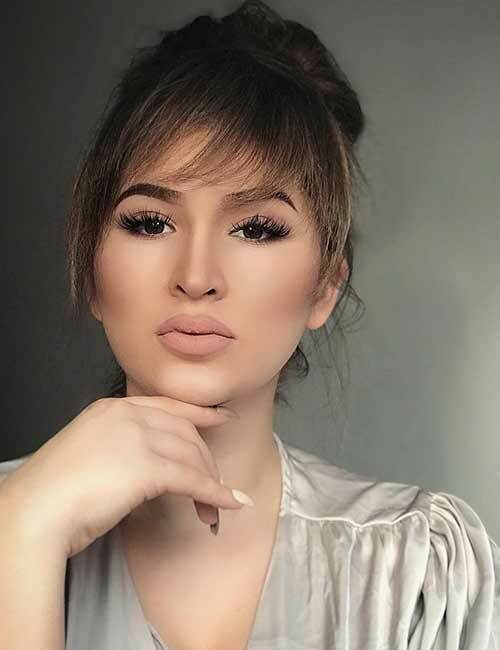 Let the center of your bangs reach just below the eyebrows, and then, as it moves towards the ears, increase the length of the bangs a little. If you are willing to experiment on your bangs, you should try this one. Take a triangular piece of your hair and cut it in a tapered way. Keep the hair closest to your ears a little longer. Color the center part a dark brown and keep using a shade lighter until you reach the hair near your ears. Make a bun and let those stylish bangs get their due! 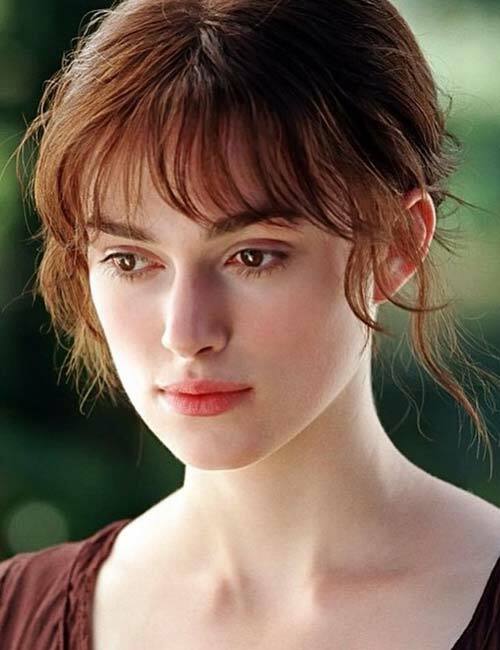 Light wavy bangs, till the eyebrows or just above it, make you look younger and fresh. If you have wavy hair, do try it. This is for the really long-haired women. Look uber cool with this trendy hairdo. This layered step cut paired with sharp baby bangs proves that long hair with bangs will never go out of style. 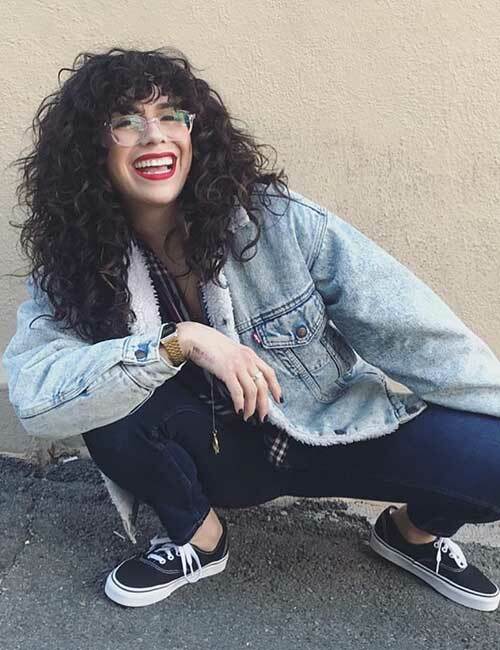 Perm your bangs!! 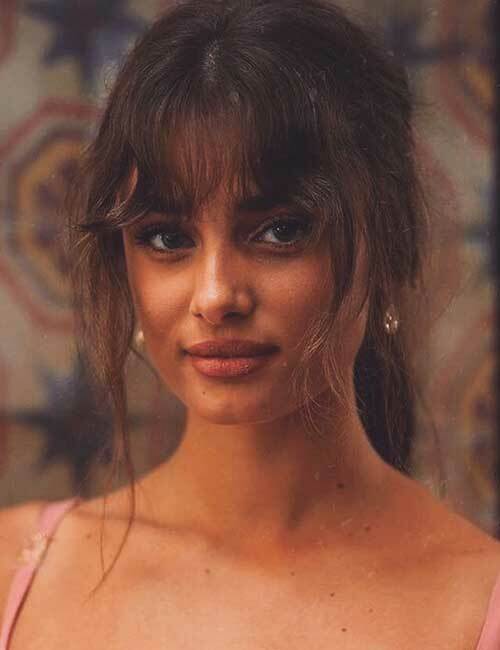 As a straight-haired girl myself, I just couldn’t take my eyes off this permed bangs look. This hairdo looks spectacular and playful as hell. Elegance redefined! You are looking at one of the best summer hairdos. 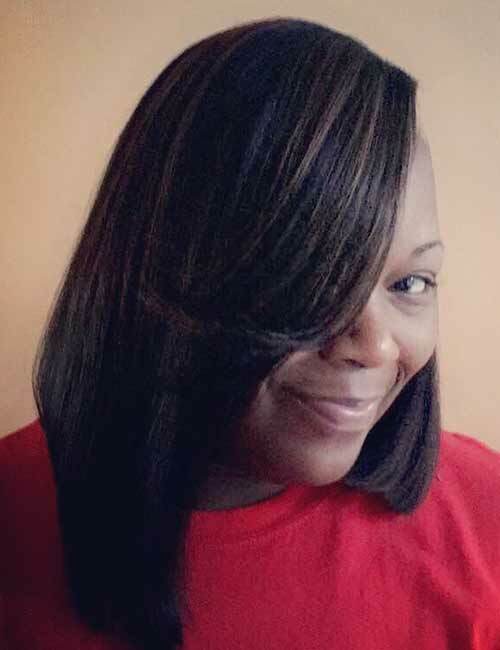 This wavy blunt haircut with feathered center bangs is so chill you just might not notice the heat this summer. 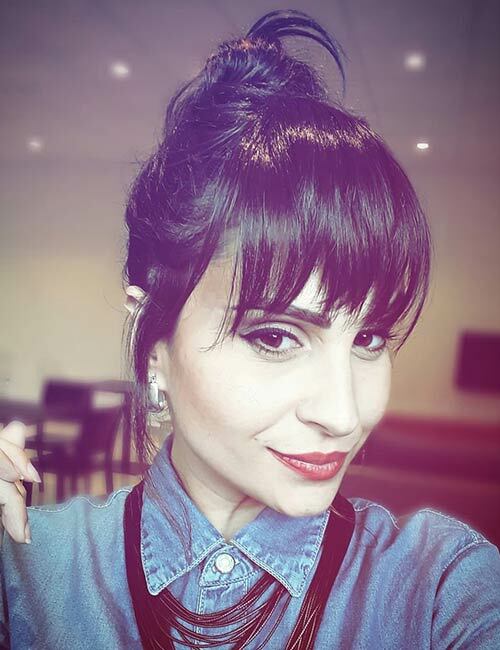 Raggedy uneven bangs are a complete #bossbabe. If you have a high forehead, then give this a try. This bangs look takes the focus away from your forehead and accentuates your cheeks. 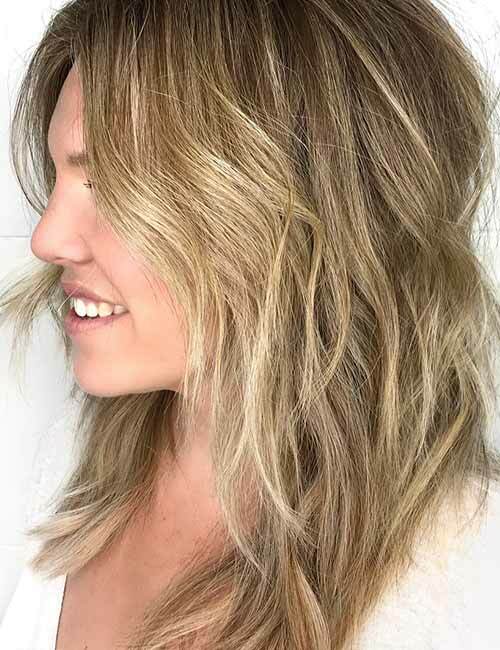 The balayage is here to stay. 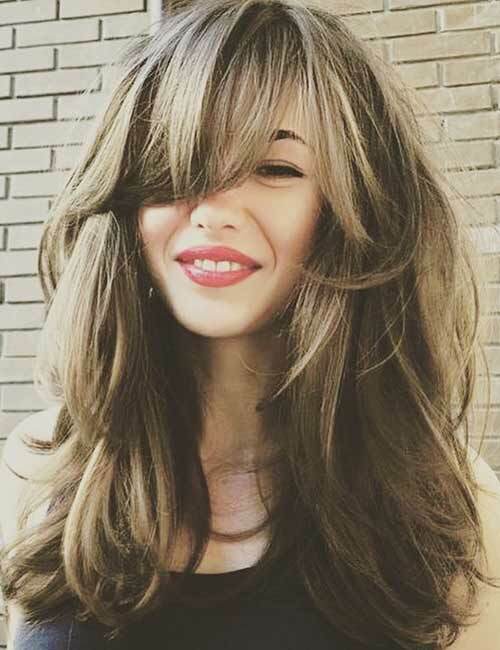 Straight bangs on a wavy balayage hairdo – trendy. It also gives your face a slimmer look. 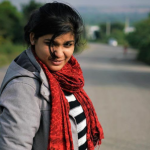 If you have thin hair, then this hairdo will work wonders for you. This razor cut with side bangs makes your hair look fuller and adds more focus to your entire face. If you’re a carefree spirit, you’ll love this. The messy wavy bangs, due to the outward tapering, brings the focus to your eyes. Also, the color job is too good. People with oval faces can work this like crazy. This hairdo is for the thick-haired. Try a razor cut if you want your hair to the focus of your look. This hairstyle oozes attitude! Simply wear it wild, and turn heads wherever you go. Wispy bangs will never go out of fashion. Using a curler, make your hair wavy, and then, at the ends, make it straight. Keep your bangs straight and wispy as well. 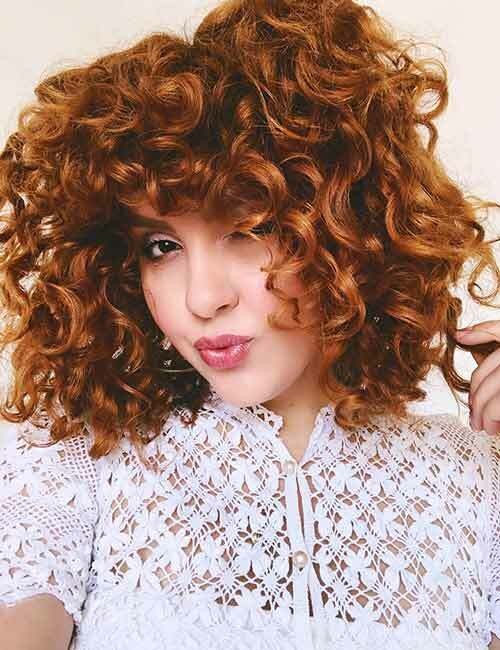 Fluff your hair to give it that extra volume. If you have a long face with a high forehead, this is the best hairdo for you! To get this look right, you need to have layers cut in your hair. Tie your hair in a low pony, slightly poofing the front part of your hair. Leave your bangs free and loose. This gives it a fake short hair look from the front and brings the focus to your jawline. Use a curler to get these crisp waves with spiky edges. Straighten out your bangs and keep them a centimeter above your eyebrows. This look adds to the wow factor of your long hair. If you want bangs but don’t want to cut your hair, here is a classy vintage hairdo for you. Take a thick triangular parting of your front hair, apply strong hold gel on it, and curl it inwards. Retro mama! For this hairdo, let a professional help you. The sleek side swept bang adds classiness to this sophisticated hairdo. This is another retro look that will never go out of fashion. Turn your hair outwards using a hair dryer to give it the complete retro feel. Using a curler and some hairspray, you can recreate this gorgeous hairdo. Tie your hair in a messy bun, leaving the end to fall out over the bun to give it a short, fuller look. And you can accessorize it as well. This look is perfect for a late or lazy work day. Instead of using an elastic band to make a bun, use a pencil clip to give it that relaxed messy feel. Long bangs are awesome. Recreate this sleek hairdo with a hairdryer and some hairspray. Try it with a triangular zigzag parting. This is an ultra-modern look that you can sport at business meetings. Take a bunch of hair and slightly sweep-curl it outwards. Curl the rest of your hair into a messy cascade of waves. Spritz on some hairspray to keep the do in place. This look works magic at formal events like work parties and weddings. If you already have bangs, try this chic hairstyle. These are box braids. This hairdo is all about showing off that sassy attitude. This look is super hot and perfect for a day at the beach. Braid your hair on one side, letting all the short hair hang loosely. Let your bang sit on one side of the face. This wavy hairdo is one of my favorites. 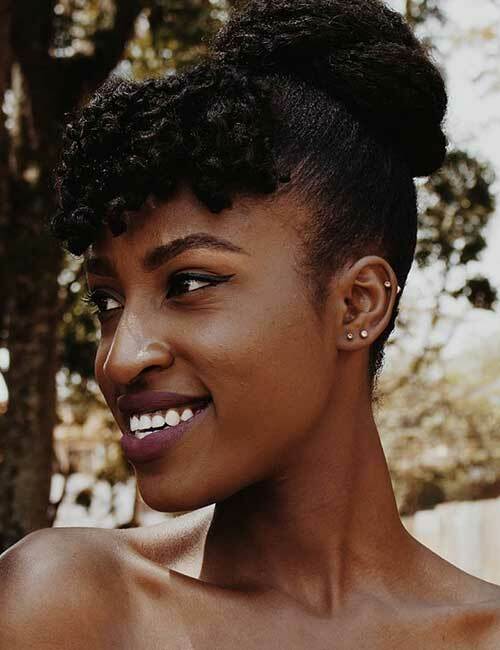 The half bun is undoubtedly a trend right now, and with these side bangs and that dark maroon lipstick, this hairdo will turn heads for sure. The half bun looks impressive on straight hair. 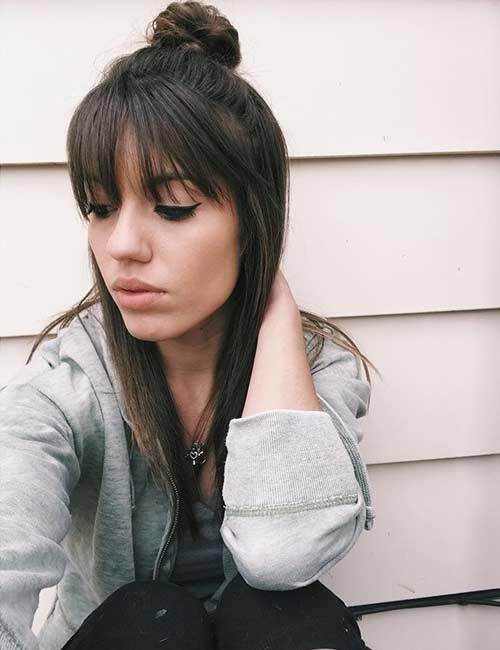 The straight bangs add an edgy feel to it. Cut your bangs unevenly at eye length to get this uber cool look. This look is perfect for those with high foreheads and round faces as it takes the focus away from the forehead and the gives the face a heart shape. 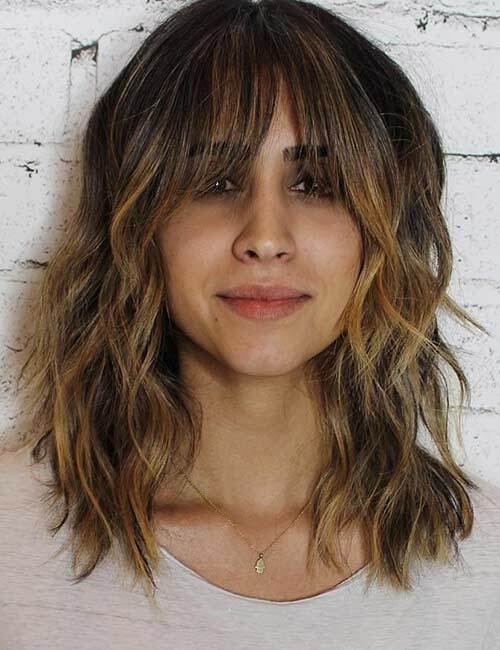 This textured unkempt long bob is all about style. Using a curler, turn one side of your thin bangs outwards. Curl your hair into wavy textures, leaving the ends wispy. This is the ultimate messy-but-I-love-it look. This look is ultra futuristic and rebellious. 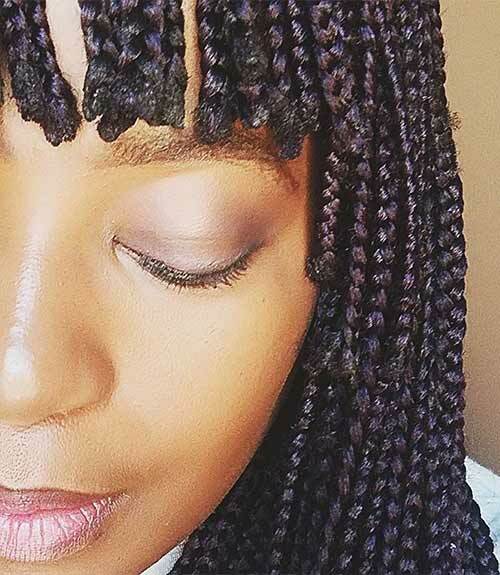 If you are tired of your regular fringe, this is the way to go. Turn heads and stun with this gorgeous hairdo. Sophistication at its finest. This look is perfect for all the boss ladies out there who run the world! This is the ultimate sweet girl look. Tie the pony, then wrap a part of your hair over it to hide the elastic. Sweep your bangs to the side. Long bangs are the trend right now, and you can’t go wrong with them. 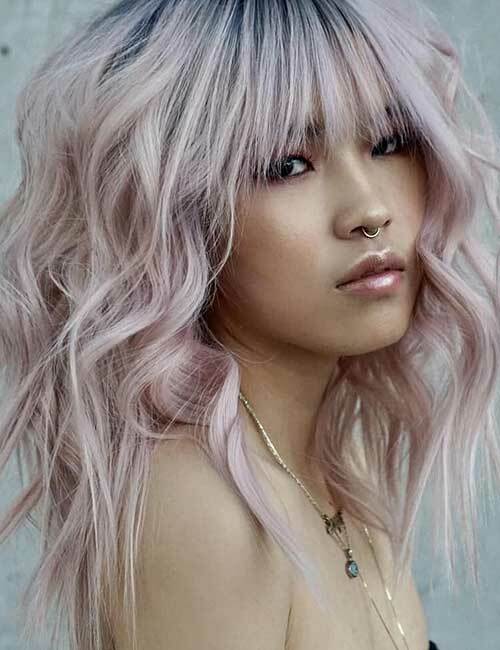 This wavy look is so hot that you’ll be the source of the heat this summer! This laid-back chill look is perfect for people with long faces. The uneven long bangs draw attention to the features of your face, diverting the focus from the forehead. If you have thick and straight hair, try this super chic look. Pair it with a dark lipstick and matching nail polish, and you are ready to take over the world. Using a hairdryer, curl the ends of your hair inward and sweep your bangs to one side. This hairdo is just stunning. Blunt asymmetrical haircuts never looked better. This hairdo takes long bangs to a whole other level. It is a definite showstopper. So, these are our list of hairstyle ideas for long hair with bangs. Go ahead and try these wicked bang hairstyles.Try accentuating your look by adding accessories to your hairdo. Try scarfs, bandanas, small combs, decorative pins, beanies and hair clips. You can also add vibrancy to these hairstyles by adding some color to it. Let us know which one was your favorite!